My presets are so well designed, structured, and organized that using them will also teach you how to create and organize your own presets. Don’t be surprised if after using my presets for awhile, you find yourself repairing the bad presets you bought in the past. I know what I like and I make my images look exactly how I want them to look. I can open up any develop pane in Lightroom and check a box, move two or three sliders and get just the right amount of grain, or exactly the tone I’m going for. But with the immense volume of work I produce, it is certain that I will need that look over and over again. In fact, getting the look I love time and time again is essential to the professional consistency I strive for and achieve. Inconsistency is disappointing to clients and I do not disappoint my clients. It is just not feasible, nor is it remotely necessary for me to move all of those sliders for each and every image. I have embraced presets in my professional workflow in a big way and I use them every day. In fact I never make the same adjustment twice. Instead, I make a preset for it. Presets are an essential part of my efficient workflow and I want you to have that same advantage. So I have created the ultimate system for structuring and organizing presets. No other presets you have purchased in the past or can purchase anywhere are as intelligently built and organized as my presets. 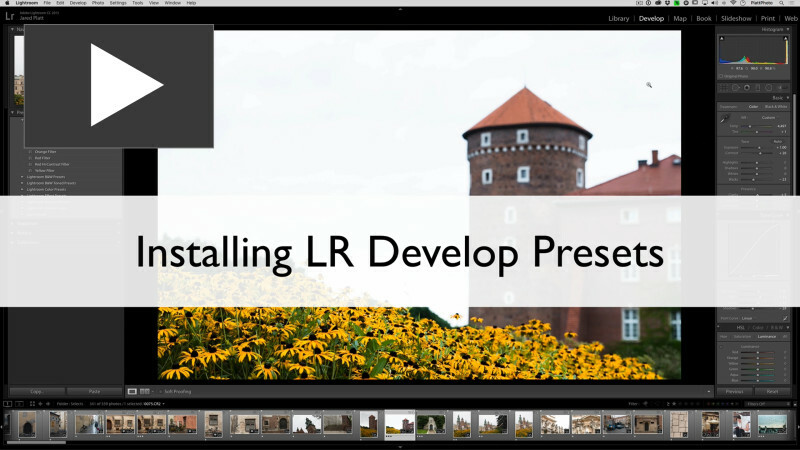 The foundational preset system that will make Lightroom work for you. DRAMATICALLY SPEED UP YOUR PROCESSING TIME. GIVE EVERY IMAGE THE TREATMENT IT DESERVES… QUICKLY. WOW YOUR CLIENTS WITH THE CREATIVE STYLE THEY ARE LOOKING FOR. ACHIEVE SOPHISTICATED EFFECTS WITH JUST A FEW MOUSE CLICKS. HAVE PERPETUAL ACCESS TO YOUR PRESETS. LEARN HOW TO MAKE YOUR OWN PRESETS TO CREATE YOUR OWN SIGNATURE LOOK. LEARN TO FIX THE PRESETS YOU BOUGHT FROM SOMEONE ELSE. SPEED UP YOUR PROCESSING TIME THROUGH PRESET ORGANIZATION. GET YOUR LIFE BACK WHILE STILL PROVIDING THE QUALITY WORK YOUR CLIENTS REQUIRE. Also, when you buy presets from Jared Platt, you always have access to your presets should you loose them, or have a hard drive crash, or simply need them on location. You also have access to any future updates to any presets you have purchased. Just simply log into your account and download any presets you have purchased in the past!